A 'Cape Dutch' style thatched villa, Crofter offers an exclusive venue for up to 12 people. Crofters is a special holiday villa which has been completely re-furbished with new thatched roof, bathrooms and new heated infinity pool and sundecks to reflect the typical Cape Dutch style. 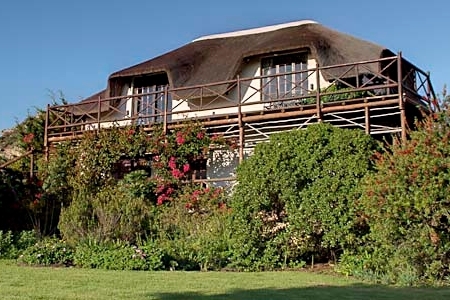 Crofters offers fully secure, extremely spacious and comfortable self catering accommodation for up to 12 guests and comprises a beautiful open plan thatched home and a separate thatched cottage set in fully landscaped gardens of 1 ¼ acres (5000 sq m) with pool and sundecks. 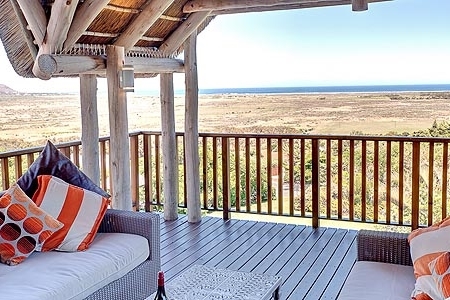 The property enjoys spectacular uninterrupted views over the ocean and mountains from Chapman’s Peak, along the 7 mile (11km) Noordhoek beach to Kommetjie. 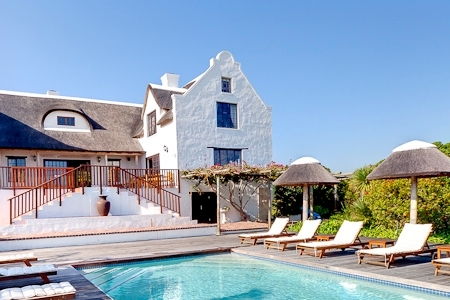 Only 35 minutes from Cape Town and the airport, Noordhoek is the perfect base from which to explore Cape Town, the winelands, Stellenbosch and the Cape Peninsula. 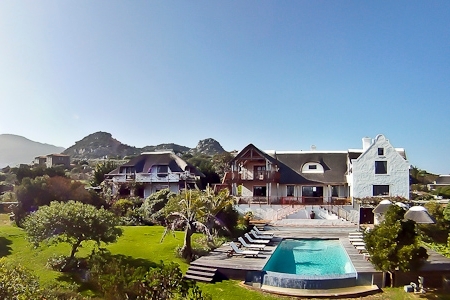 Local attractions include the penguins at Boulders Beach, historic Simon’s Town, golf, tennis, horse riding on the beach, hiking trails through the Silvermine Nature Reserve, surfing and sea kayaks, seasonal whale and dolphin watching, Cape Point and the scenic Chapman’s Peak drive to Hout Bay. There are many local craft shops, coffee shops, restaurants and pubs at the Noordhoek Village or near the beach at the Red Herring Trading Post. A major supermarket and modern shopping mall is only a few minutes away at the Longbeach Mall. 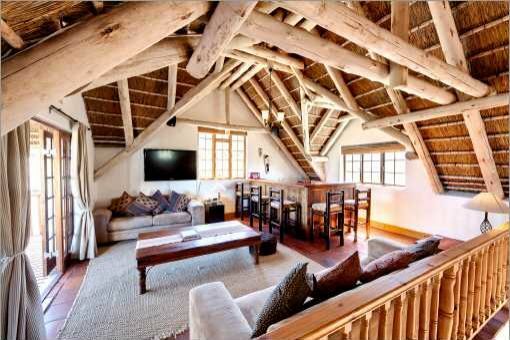 Crofters main house with vaulted thatch roof and exposed beams, is ideal for large parties up to 12 guests although smaller parties are also welcome. 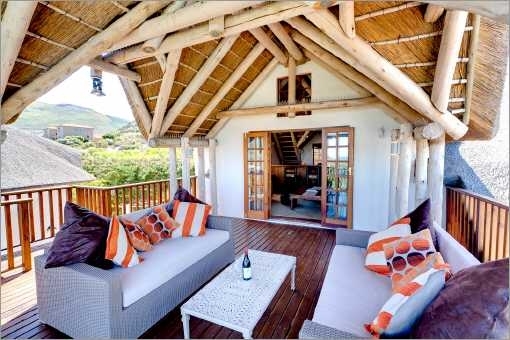 The entertaining areas are the main lounge, the tv/bar room, the reading room and the outside upper deck with far reaching views. The large kitchen with central island is fully equipped off which is the large terrace with tables. There are 4 en-suite bedrooms, each with splendid views over the ocean, lakes and surrounding mountains. 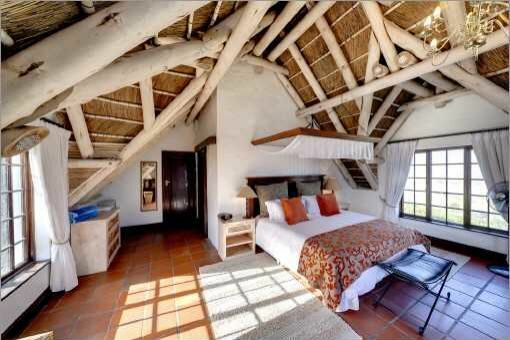 The villa has 4 spacious en-suite bedrooms, each with fantastic views. Each bedroom is well equipped with a hair dryer and an alarm clock/radio/MP3 player and each bathroom has a heated towel rail and electric shaver point. 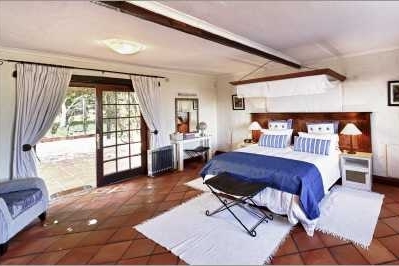 All bedrooms (apart from the Master) can either be configured to have a 6’ double bed or two 3’ twin beds. 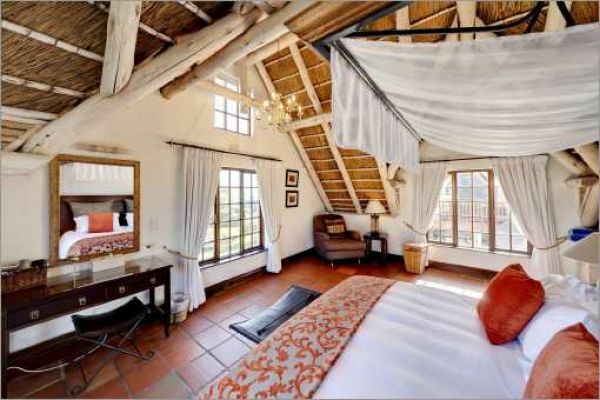 The ’Master’ bedroom is upstairs, has a 6` king bed and is a triple aspect room with a vaulted thatched roof and exposed beams having magnificent views over the lakes, the Atlantic Ocean and the Chapman’s Peak mountains. 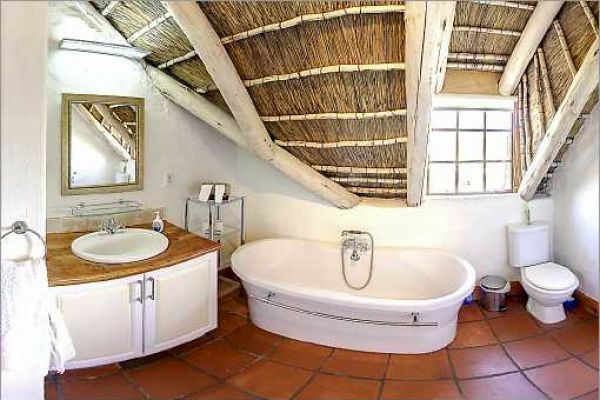 The en-suite bathroom is equipped with a basin, wc, bath and separate shower. The bedroom has a safe and the master control panel for the alarm system. 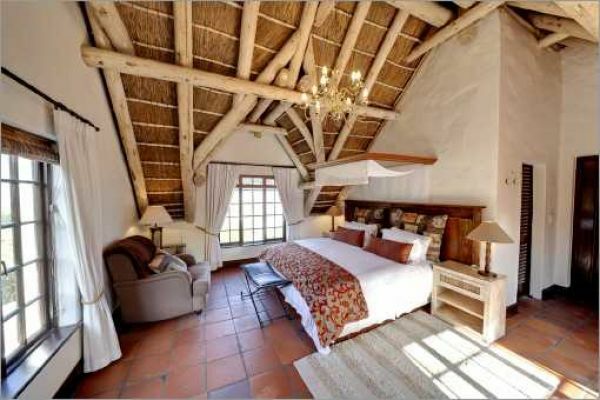 The second upstairs bedroom, the ’Silvermine’ room, is a triple aspect room with a vaulted thatched roof and exposed beams having beautiful views of the lakes and the Silvermine mountains. This bedroom has a safe as well. 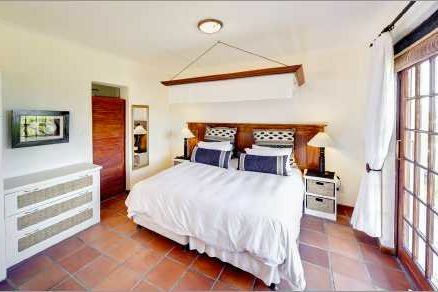 The en-suite bathroom is equipped with a basin, wc, bath and separate shower. The front ground floor bedroom, the ’Lakeview’ room, situated off the entrance hall, is a double aspect room with views of the lakes and mountains and has direct access to the rear garden and breakfast terrace. 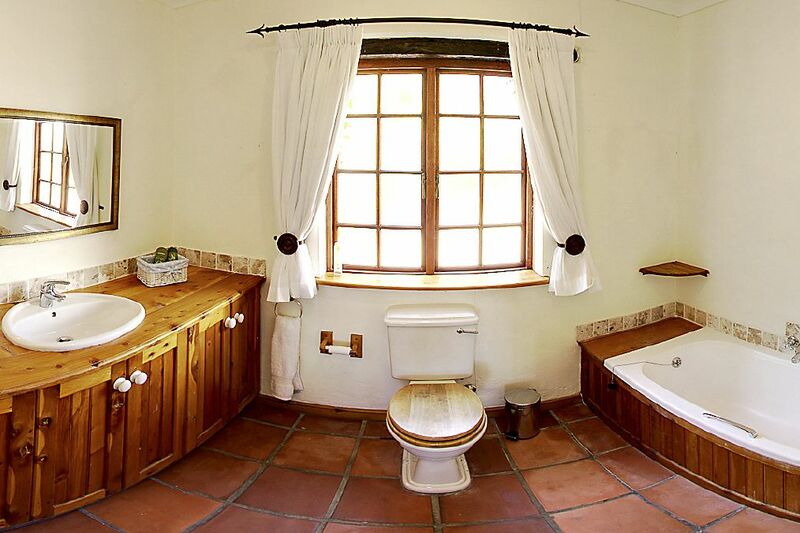 The en-suite bathroom is equipped with a basin, wc and a shower. 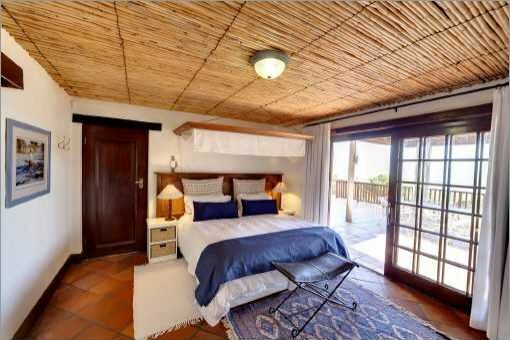 The rear ground floor bedroom, the ’Atlantic’ room, is a double aspect room with views of the ocean and mountains and has direct access to the main terrace. The en-suite bathroom is equipped with a basin, wc, bath and separate shower. 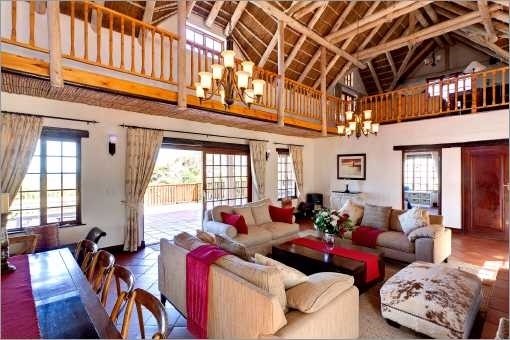 The main feature of Crofters Villa is its very large and comfortable lounge for entertaining, dining and relaxing. 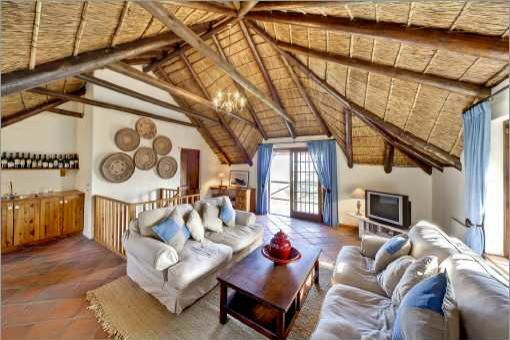 It has an open fireplace, a high double storey vaulted thatched ceiling with exposed beams, has sofas and a large dining table to seat 12, and has access to the furnished front terrace with spectacular sea and mountain views, as well as access to a rear breakfast terrace covered with bougainvillea. Upstairs and overseeing the lounge is a generous tv lounge equipped with a large flat screen tv, VHS/DVD, hi fi and bar with a fridge. 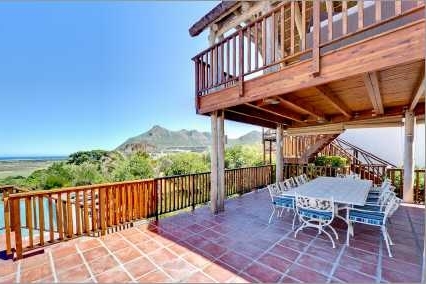 There is access to a furnished elevated sun deck, with spectacular 270-degree views from the lakes, the ocean and the mountains. 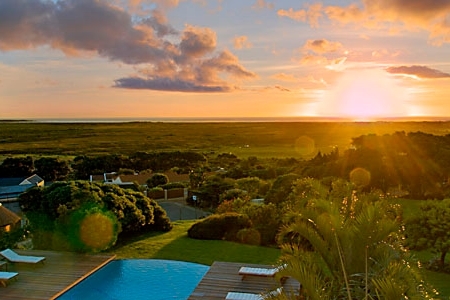 It is the ideal place to watch the sunset on the Atlantic Ocean while enjoying a ’sundowner’. Also upstairs and overseeing the other end of the lounge is a reading room with a selection of books and guides to local amenities. A wireless internet router is provided to enable guests to access their emails and internet on their own laptop anywhere within the villa if they have wireless capability, or directly with a cable. A gallery landing connects the reading room to the TV lounge and bar. 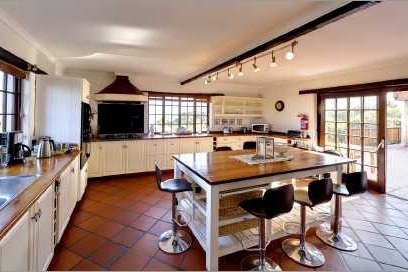 The large, fully equipped kitchen has an open fireplace, a large central island breakfast bar with 8 bar stools, microwave, electric double oven and gas hob and an American style double fridge with ice maker. 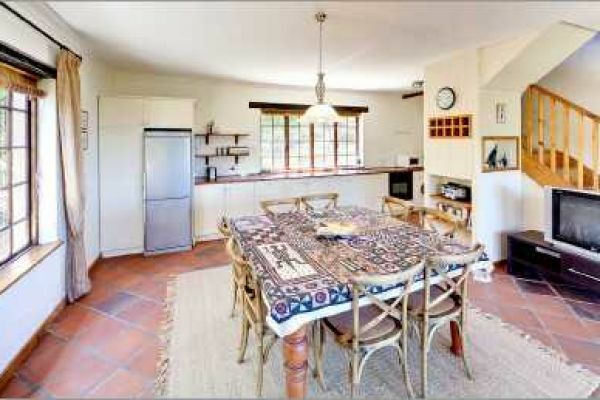 There is an adjoining scullery with sink, dishwasher, washing machine, tumble dryer, iron and ironing board. To the front there is a very large sun terrace, fully furnished with 3 sets of tables and chairs and sun loungers with shade available under the elevated sun deck and umbrella. This terrace is the place to be to relax and enjoy the spectacular views. To the rear there is another terrace which gets the sun in the morning and has table and chairs ready for an 'al fresco' breakfast. 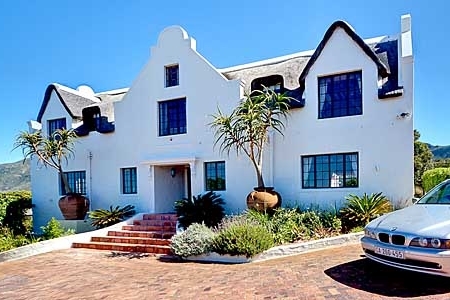 2 BBQ's are situated below the front terrace providing the flexibility for large braai parties. 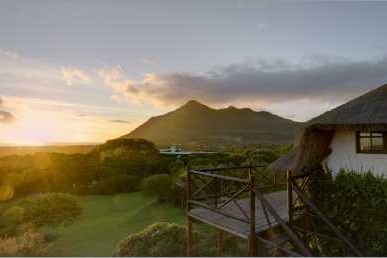 Enjoy the best views over the whole valley and the beach from our elevated sundeck. 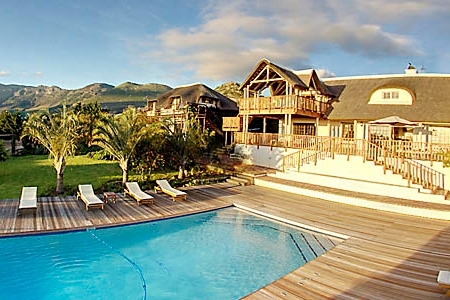 The 1 ¼ acre (5000sqm) garden is wonderfully laid out with indigenous plants and trees and benefits from the extensive panoramic views of the mountains and the Atlantic Ocean. 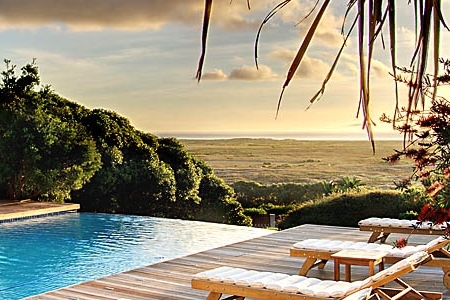 The heated, 10m x 5m infinity pool with its 147sqm of decking, 12 sun loungers and thatched umbrellas is the perfect place to relax or party and enjoy the evening sunset over the ocean. The rear garden benefits from a morning sun terrace covered in bougainvilleas and provides the ideal location for an 'al fresco' breakfast. The Cottage is also thatched with exposed beams and offers accommodation for 4 people. 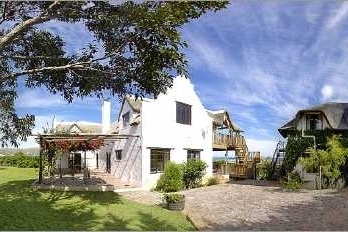 The Cottage has a ground floor veranda and an upstairs balcony, both with spectacular views of the lakes, ocean and mountains. 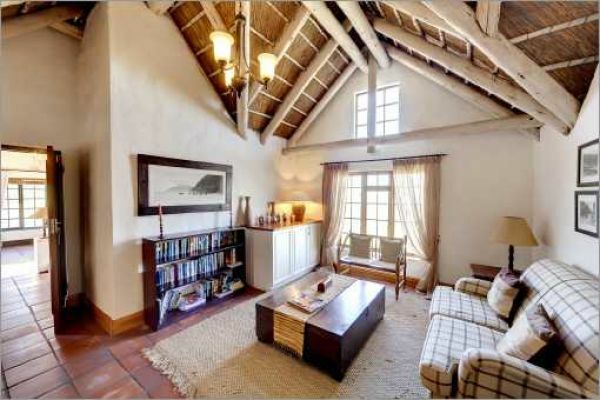 Entry to the Cottage is via the large kitchen/dining room which is fully equipped and includes a tv and radio/CD/MP3 player. 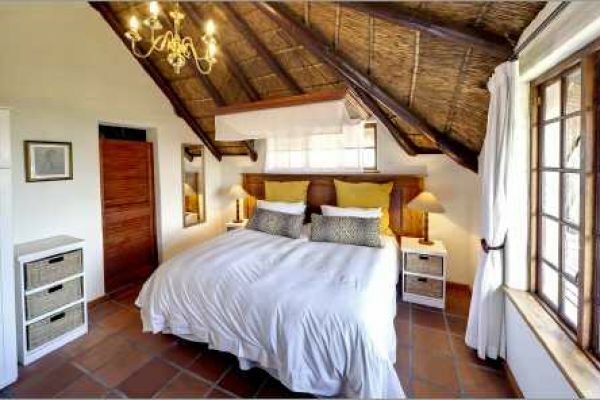 There are 2 en-suite bedrooms; on the ground floor the ‚’Longbeach’ room with a bath/shower and upstairs the ’Safari’ room with a shower. Each bedroom can be configured to have either a double bed or two twin beds and are equipped with a hair dryer and an alarm clock/radio/CD/MP3 player. 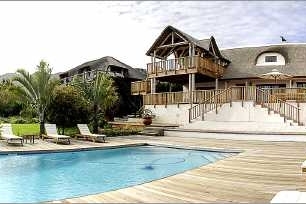 The lounge is upstairs to enjoy the view and sunset over the ocean and is equipped with a tv, hi fi and a fridge. To ensure guests have all the privacy they need, Crofters is only book on an exclusive basis, no matter how small or large the party is. 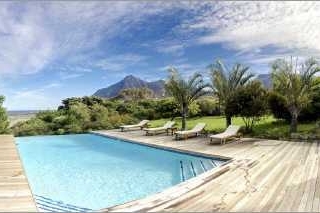 For parties up to 8, or where 4 bedrooms will suffice, bookings will be based on the Villa only. 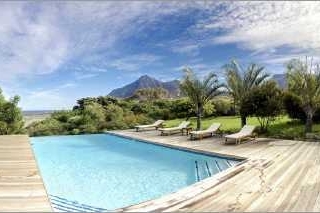 For larger parties, or where guests need 5 or 6 bedrooms, bookings will be based on the Villa and Cottage.